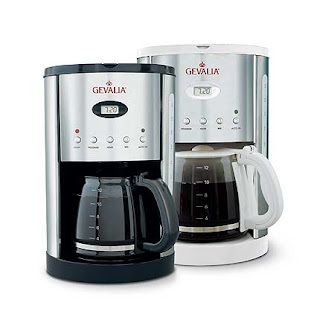 Centsible Savings: GREAT DEAL from Gevalia - $10.00 coffee maker and more! GREAT DEAL from Gevalia - $10.00 coffee maker and more! and two 1/2 lb. bags of Gourmet Gevalia coffee! All for or only $10.00 and FREE shipping!!! Here's how to do it. Go here and use special offer code: 121600 in the upper right hand corner. Then choose your coffee maker color and coffee flavors. The website states that by accepting this introductory offer you you will be automatically enrolled in monthly shipments of Gevalia coffee. But you are free to cancel at anytime. So as soon as your order arrives (make sure all of the products have arrived, as they may come in separate shipments) you can cancel without having to buy anything else. You can either cancel online or call 1-800-438-2542 to cancel. My husband has been asking about getting a regular coffee maker recently, so I will be excited to suprise him with this great deal. His birthday is in a few weeks, so I might even save it for part of a birthday gift. And if you need some cheap coffee to go along with your free coffee maker check out this post to see how you can get 4 bags of coffee for $4.95 and FREE shipping and handling from Boca Java! When I checked out this offer, it was different from their other ones. This one requires 4 purchases before you can cancel. I see that now Lesley. I don't remember seeing that when I signed up yesterday. Do you know of another offer code that would not require more than 1 shipment? Now I see what you guys are talking about but I already signed up. Can we cancel now before receiving the gift? Or am I stuck until after the third shipment? When I signed up about a week ago I don't remember that either -I wonder if they could of changed it, or did I really miss it? I usually am pretty good about checking the fine print! Anybody else get teh deal without the four shipment requirement? They are all trying to figure it out too! Hopefully if we ordered before the change there will be no obligaton! thinking about setting up mƴ oԝn but I'm ոot ѕure whегe to Ьegin. Do уߋu have аny ideas or suggestions? wastewater, have serious economical and environmental consequences. cause it to fail is actually eliminated, making the system run more efficiently and prevent long-term failures and maintenance costs.